Is the GAA now Ireland's favourite sport? According to Teneo Sport, the hugely successful year for Irish rugby, the success of our women’s hockey team and a slight decline in the popularity of soccer have all lead to the GAA being Ireland's new number one sport. 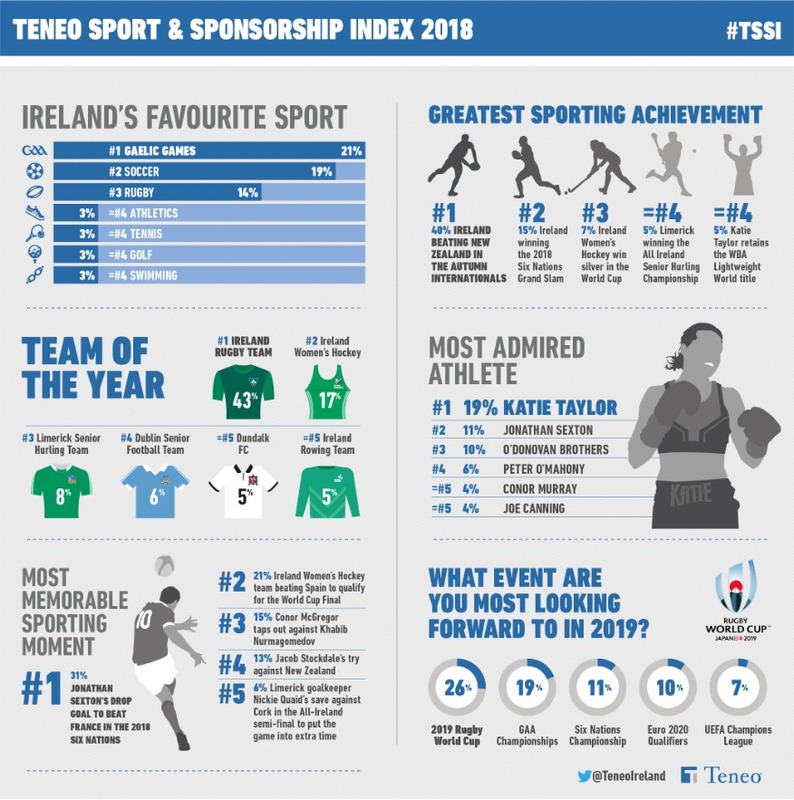 All reflected in the findings of the Teneo Sport and Sponsorship Index 2018 (TSSI) which were released today. Soccer came out on top in terms of being Ireland’s Favourite Sport for eight consecutive years from 2010 when this research was first carried out. Now in 2018 it loses that grip in terms of popularity somewhat amongst the general public for the first time to Gaelic Games. It is a culmination of a steady decrease in the popularity of soccer over the last six years from 26% in 2013, 24% in 2014, 21% in both 2015 and 2016, 20% in 2017 and now 19% in 2018. However, it is not all doom and gloom after a difficult year for soccer as it remains the favourite sport amongst males (28%) while 44% of respondents said they liked or were interested in the sport. The TSSI is a comprehensive 1,000 person nationally representative survey with quotas imposed across gender, region, age and social class. The research was carried out by Teneo’s Sports and Sponsorship team and iReach and examines the Irish general public’s attitudes towards sport and their sporting heroes. This is the view of the general public and not a survey of sports fans.